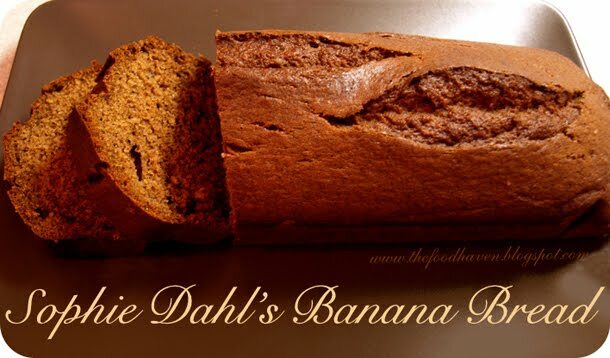 Sophie Dahl: I used to make banana bread in the fierce winters when I lived in New York and it was too freezing to do anything but bake. Eat it warm out of the oven with a lick of butter - it's unadulterated manna. Fits a rectangular loaf pan (30cm long, 11cm wide, 7cm deep). I did it in a bread machine, and it worked fine. I needed to manually mash the bananas and melt the butter - the machine isn't very good with mixing big pieces of stuff. Didn't use any specific program - just set it to kneading to mix the batter, and then bake-only for about 75 minutes to bake it. It took longer because machine wasn't preheated. Margin note: 150g dark sugar is 2/3 cup; 75g butter is about 1/3 bar (or 2/3 stick for Americans); 170g of flour is 1 and 1/3 cup. Great that it worked :) Thanks for the measurements in cups, I'll update the post. Thank you so much for the American measurements! I am making this for my MIL for Mother's day and she's got my book!